Fall is upon us with its cool, crisp and refreshing weather, beautiful changing leaves, and many chance for outdoor fun. But it also means colder air, dampness, and shutting ourselves indoors at times, with dry, heated and stale air. It’s a time when germs and viruses seem to populate and insert themselves into our previously healthy bodies. 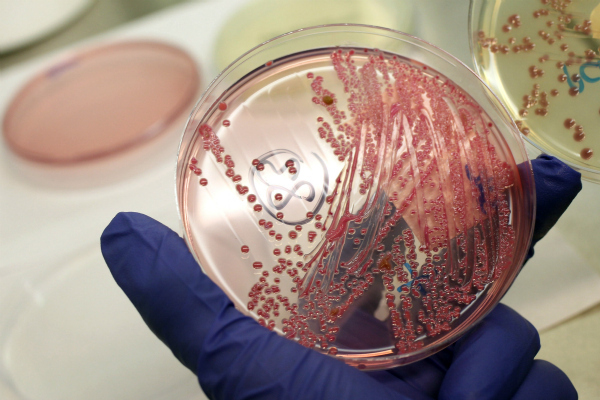 Kids get exposed to all kinds of germs at school. We bring home germs from work. No matter what precautions we take, inevitably, someone in the family gets sick. And once one person is sick, it seems to make its rounds to everyone! What’s a parent to do? fungus, and bacteria. Once mixed in the bees’ bodies and used to coat every surface inside the hive, bee propolis keeps bacteria, viruses and fungus molds and yeasts from growing in and infecting the hive. In the fall, the bees continue to add layers of propolis to keep the hive germ-free, seal cracks and insulate for winter. An experiment done by researchers at The University of Minnesota found that bees housed in a nest box coated with propolis had lower bacterial loads in their body and also ‘quieter’ immune systems compared to the colonies with no propolis coating. Seventy years of research on bee propolis indicates that this substance can also do the same for us! 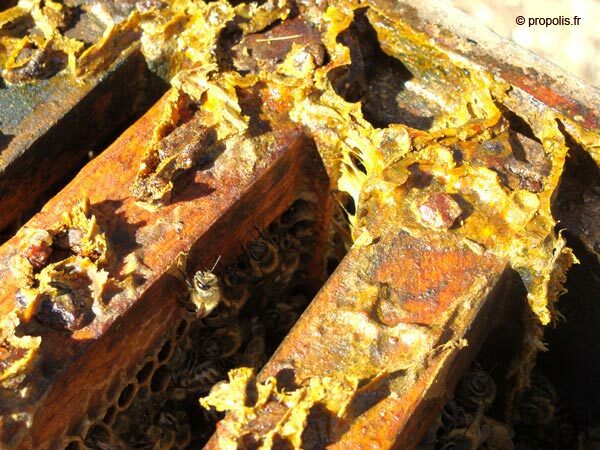 Propolis can boost our immune system and overall wellness, as well as kill many bacteria and viruses. Propolis provides general immune system support. Propolis actually stimulates the immune system and raises the body’s natural resistance. Its antimicrobial properties suppress harmful bacteria and infections. This powerhouse substance contains 500 times more bioflavonoids than is found in oranges. Flavonoids have strong antioxidant properties and help to protect cells from free radicals and cell mutations. Propolis contains all the known vitamins, except vitamin K. Propolis contains 13 of the 14 minerals our bodies reauire, with the exception of sulfur. You don’t have to swallow a whole handful of vitamins and minerals. Instead, you can use about 10 drops( about a half-dropperful) of 10% propolis oil or tincture, daily, to strengthen your immune system and supply your body with ample antioxidants, vitamins and minerals. And kill those nasty germs before they get established in your body! Our four generations of family members and close friends (ages 5-84) have diligently taken daily propolis during the cold months, for over four years now. We can honestly tell you that there have been only 2 visits to the doctor, in these four years, for common ailments among over twenty friends and family. We triple our dose to three times a day, if we feel like an illness is coming on, and typically symptoms are gone in 1-2 days. We have staved off upper respiratory infections, sinus infections, migranes, ear infections, colds, cough, and sore throats. But don’t just take our word for it. There is much research about propolis as an immune system booster and on its effectiveness against staff, strep, rhinovirus (common cold), upper respiratory infections, chronic ear infections, and many other illnesses. Here are some links to this research. To get the general gyst of the articles, read the abstract at the beginning and the summary at the end! If the bees make it through the winter? Five hives? Ten hives? Fifteen? Twenty? And five boxes of honey to pull! 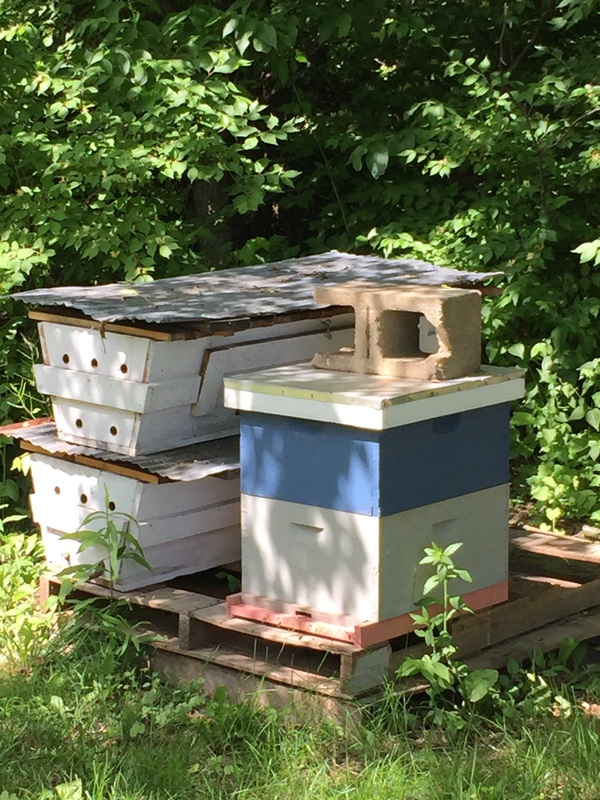 It’s been quite a spring with our bees, and we feel like we are finally getting the hang of things after 5 years of beginning beekeeping and many conferences and beekeeper meetings where we get tons of helpful information. 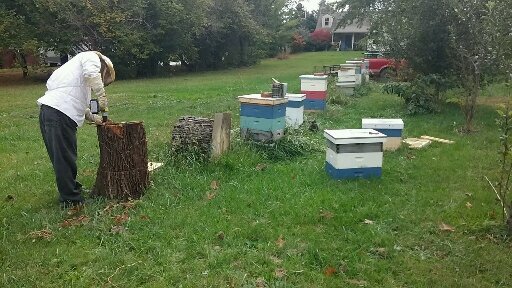 At the Dotson Apiary, they had four hives make it through the winter an d these were thriving and multiplying in early spring. In the Saum Apiary, we had three make it, but they started the spring out kind of small and weak. We were happy with the survival rate, compared to last year. At the Saum Apiary, we had a small disaster in the last snow and wind storm in February. Our tarp wind break broke loose at one end and whipped around in the wind, knocking off the covers of three hives. We didn’t find this out for several hours, so those bees probably succumbed to the cold and lack of protection. We’ve been out in our hives every two weeks, installed four new nuc (5 frame starter hives from an experienced beekeeper with overwintered bees and queens), caught a swarm from one of our hives, captured a swarm after a call from a neighbor, and made five hive splits from the Dotson’s booming hives and started 3 nucs with queen cells we found. 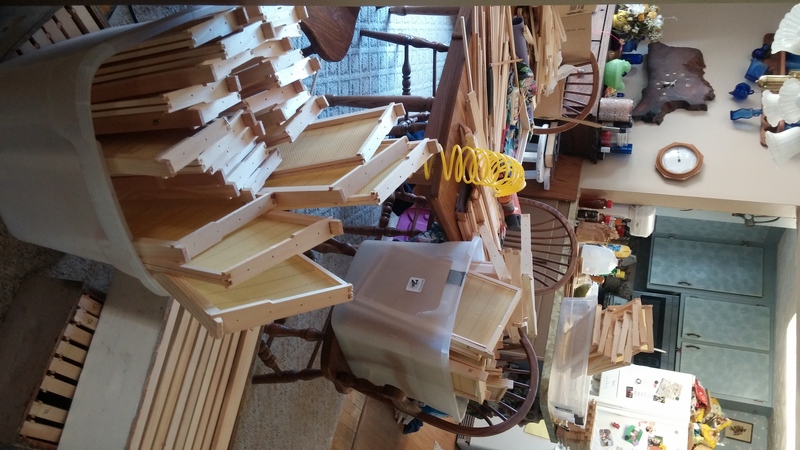 We’ve also been building massive amounts of extra equipment – boxes and frames – so we have extra boxes to put on our hives as they grow and make honey during the summer and fall. 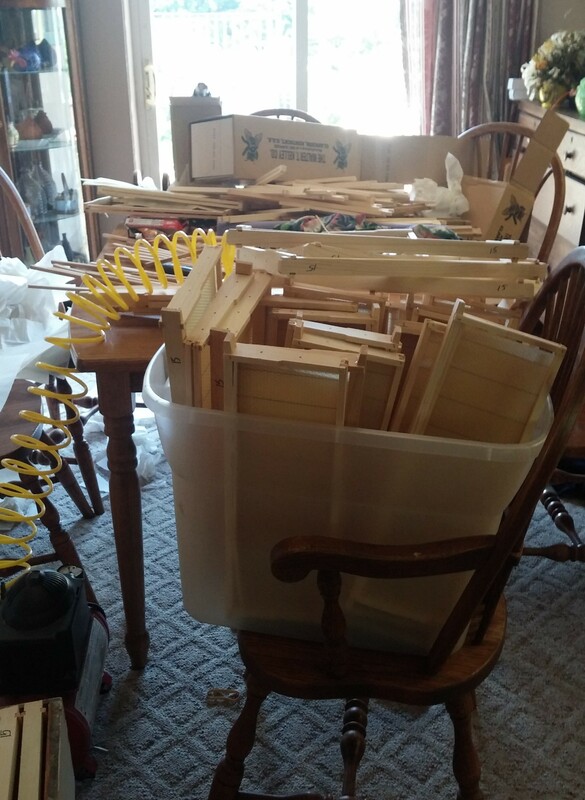 Our daughter said our dining room looks like a bee supply company threw up in it! 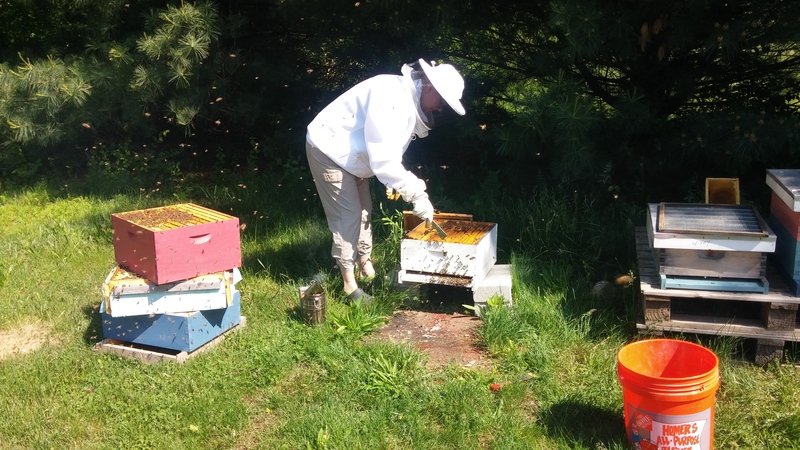 And next week, we will have five boxes of spring honey to harvest! We’ll keep you posted as to when that is ready! the grain, the new wine and the olive oil, the young of the flocks and herds. They will be like a well-watered garden, and they will sorrow no more.